Over the past five years, singer/songwriter Cole Swindell has emerged as a consistent hitmaker in country music. His current single, “Break Up in the End,” has become his eighth Top 10 country hit as an artist. 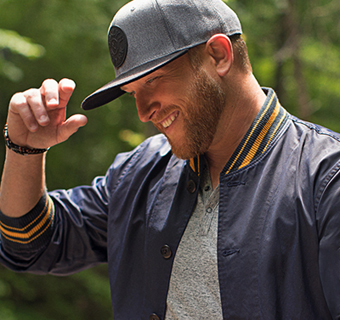 Swindell has just released his third album All Of It (on Warner Bros. Nashville Records), which contains several other songs that are potential singles. Originally from Georgia, Swindell has also co-written hit songs for other artists. Impressively, he co-wrote the big hit “This Is How We Roll” for Florida Georgia Line. He’s also co-written about 10 songs for Luke Bryan including the hit, “Roller Coaster.” In addition, Swindell co-wrote the hits “Get Me Some of That” for Thomas Rhett and “Outta My Head” for Craig Campbell. For his own artist career, Swindell has co-written his breakthrough #1 hit “Chillin’ It,” plus his other hits including “Hope You Get Lonely Tonight,” “Ain’t Worth the Whiskey,” “Let Me See Ya Girl,” “You Should Be Here,” “Middle of a Memory” and “Flatliner” (featuring Dierks Bentley). On his new album All Of It, Swindell has chosen to record more songs that were written by other songwriters. His heartfelt, ballad single “Break Up in the End” was written by Jon Nite, Chase McGill & Jessie Jo Dillon, and Swindell calls it one the best songs he’s ever heard. Another favorite of Swindell’s is the title cut “All Of It,” which was written by Bobby Pinson, Dallas Davidson & Kyle Fishman. A key song on the album that was co-written by Swindell is “The Ones Who Got Me Here,” an emotional song where he reflects on all the people who’ve had an impact on his life. In the past five years, Swindell has had both commercial success and he’s won several awards. In 2015, he won the ACM Award for New Artist of the Year, and he’s been nominated for CMA and CMT Awards. He was also named NSAI Songwriter/Artist of the Year in 2016, and he’s won CMA Triple Play Awards. We are pleased to do this new Q&A interview with Cole Swindell. He talks about the making of his new album All Of It, and his favorite songs on the album. He also discusses his songwriting process. Note: This is our third article with Swindell. In our 2014 article, he talked about his debut album Cole Swindell, and in our 2017 article he discussed his second album, You Should Be Here. DK: Your new album All of It has just been released. Can you talk about the making of this album? Swindell: It’s my third album, and I went into it with the same process as the first two, which is…best song wins. On my first album, I had written most of the songs on the album, and that’s how I got my label deal. [But] with the new album, I wrote a little less than half the album. It’s pretty crazy, but I’m now in the position to work with some of the best songwriters in Nashville, and they’re sending me songs that are so good, I wish that I had written them. It’s just a huge compliment…I can’t believe I’m in that position to record some of these songs. So with this album, that’s what it’s about to me…the best songs. I think we’ve got the best 12 songs we could record. DK: With your album being a combination of songs written by you and by other writers, how do you fit your own, more personal songs, with the ones you liked from other people? Swindell: I try to write as much as I can, because I think it’s easier to tell your story when you’re writing it. But you know, it’s pretty crazy when somebody else writes songs [that express] exactly how you’re feeling. DK: I watched the videos of your new songs “Somebody’s Been Drinkin’,” “Break Up in the End” and “Love You Too Late,” and there seems to be a story concept, with the same woman (Alicia Watson) featured in each video. Swindell: Yes, we’re doing a whole concept thing. She’s in four videos that we filmed leading up to the album release date. We first released “Somebody’s Been Drinkin’” followed by “Break Up in the End” and “Love You Too Late.” The last one is for “All Of It,” so you’ve got to watch and see how it ends up. When we were making the album, we didn’t plan on releasing the songs in this order. But somehow, we found a way to make all four songs go together and tell one story. And with (the video for) “All Of It,” we’ve got a happier ending. DK: In a recent interview, you said how much you liked “Break Up in the End” and that it’s very special to you. Can you talk about this song? Swindell: Yeah, it’s one of the best songs I’ve ever heard. I think lyrically it’s perfect, and it just hit me right in the heart…I’ve certainly lived that. I think it’s a breakup song, but it’s also a love story…to have that kind of love where you really don’t regret it; it’s just not gonna work out. You know you wouldn’t change anything…you wouldn’t go back and not do it. I’ve had breakup songs, but this one’s a little more mature breakup song. It’s the worst kind, you know. I thought the ones where you were fighting and didn’t want to talk to each other were bad, but this is way worse when you care about it, but it’s just not gonna work. And I just know that if I’ve been through that, there’s somebody else out there that has, too. When we play this song live, I can tell that it’s growing and getting bigger, by the fans singing along every night. And it’s the best feeling in the world. DK: Another new song I like is “The Ones That Got Me Here,” and it sounds like a hit. Can you talk about this song? Swindell: Yeah, this is my favorite song I’ve ever written, except maybe “You Should Be Here.” I’ve always wanted to have a song that mentioned everybody that’s [been a part of my life]. It’s a personal song to me. It’s about the people who believed in us and helped us to get here…that’s what this song is. It even mentions the people that thought I didn’t have a chance (laughs). But it’s more about the people that did…from family to friends to everything, man. DK: With your songwriting process. do you like coming up with lyric ideas or concepts before you go into a writing session? Or do you usually come up ideas when you’re in the session? Swindell: There are days when you just don’t have anything (laughs). Sometimes (in the writing session), the best days are when you’re sitting there having a conversation, and you go, “Man, that can be a song.” And then it turns out great. But it’s harder to do that. I like to be prepared going into a (writer’s) room and have at least some lyric ideas or melodies. Especially in the beginning of my career, I was going into [a writing session] with people that I couldn’t believe I was getting to write with (laughs). So I brought in as many ideas as I could. But you run out of ideas, so that’s why I think you need some down time to be prepared…to think and have ideas. And that’s all you can do—just be aware, and having your phone and writing down ideas. I’m always writing it down and being ready. DK: I read your album credits, and it says all three of your albums were produced by Michael Carter, who also co-writes with you. Can you talk about what makes you and Michael such a good team? Swindell: Early on, I was out on the road selling T-shirts for Luke Bryan; that was my first job. I was also writing songs with any free time I had out there. Michael has played guitar for Luke for almost 20 years, and we’d be writing out on the road. We’d always just come up and write together. I was the first artist that Michael produced. He was the one in charge of doing our demos and finding the band we needed to record our stuff. I remember that we found the right band, we found the right person that we liked mixing it, and we wrote a song together called “Roller Coaster” which Luke Bryan recorded. And I remember the only reason that we played it for Luke was so he could hear my vocal on it, and the band we had. We were just excited that we found our little team of people to do our demos, because I didn’t have a record deal then. Luke heard “Roller Coaster” and flipped out, and ended up recording it. That’s how Michael and I got started. When I signed with Warner Bros., they were cool with all the stuff that we had recorded and they were like, “No, why change it if it works?” And Michael just works so hard on the stuff, and I’m getting more comfortable in the studio and we’ve been around each other forever. So I’m glad that he’s a part of this third album as well. DK: Five years ago, you released your first album, and since then you’ve had a steady flow of hits on the charts. So how does it feel to have this success for five years, compared to when you were starting out? Swindell: Well, it’s different. You know, radio right now is different. The way people consume music is different. It’s almost a different world than just five years ago. You know, when you’re the new guy and you’ve got the hot song—I remember that’s how it started with “Chillin’ It” with me. I followed that up with some success, but now you get to a middle ground, where it’s like…Alright, I’m not where I want to be yet, but I’m not the new person anymore. I’ve got to keep fighting and record the best songs I can, and keep putting on the best shows I can. You keep grinding to where we want to go, because you know you’re not the new guy, but you’re not playing stadiums yet. But it’s motivating. It’s…Hey, you’re not even close yet. As good as my career started off, I’ve got a long way to go and a lot of people to reach. So it’s knowing that we’re very fortunate to be here, and we want to keep it going. And I honestly think that it starts with the songs. That’s what I’m gonna try to do…record the best songs I can.